Like most chameleons, the veiled chameleon is a specialized tree dweller. It has a flattened body meant to mimic a leaf, and feet specially designed for grasping limbs and branches. Its prehensile tail acts as a fifth appendage and aids in climbing. They have a casque, a helmet-like ridge, on top of their heads, which is a tiny swelling as a hatchling, but grows to 5 cm in height as the animal matures. Veiled chameleons are often kept in captivity because they are hardy when compared to other chameleon species often offered for sale; however, all chameleons require specialized care and should not be considered a beginner’s reptile. Adult Veiled Chameleons should be housed in a 0.6 x 0.6 x 0.8 meters (2 x 2 x 2.5 feet) terrarium whilst juveniles should be kept in much smaller terrariums. They can be housed in either glass or air screen terrariums. Small Chameleons should be fed well so if they are kept in large spaces it will be more difficult for them to find their food. You should avoid housing two Chameleons together except during their mating season. The enclosure must be decorated with plants and branches of various sizes (preferably live plants and not plastic) as live plants help to raise the humidity and make the Chameleon feel as they are in their natural surroundings. Most animals will feed on the plants that you put in their surroundings which is why it is important for you to provide the correct plants that Chameleons can digest. Some of the plants that you can use which are proven non-toxic for Veiled Chameleons are : Asparagus falcatus, Asparagus densiflorus, Buxus sempervirens, Buxus rotundifolia, Chamaedorea elegans, Crassula ovata, Hypoestes phyllostachia, Epipremnum aureum, Ficus benjamina, Ficus elastica, Ficus pumila, Hedera helix, Nephrolepis exaltata and Scheflera arboricola. The substrate helps to retain humidity so use sand, peat or soil. Most owners/breeders do not use substrate for the reason that in their humidity facilities they are already elevated and do not need more moisture. We do not use substrate only if the humidity level is satisfactory. Chameleons are diurnal reptiles so ultraviolet UVB lighting is essential for both their survival and organization which needs the synthesis of vitamin D3. The lighting is achieved by using lamps that emit radiation UVB 5.0 for reptiles living in tropical zones. Attention should be given to the distance of the lamp from the animal; we recommend 20 points or more. The proximity of the lamp from the animal can cause skin burns or conjunctivitis in the eyes if it is placed too close. During the summer months the lighting should last 14 hours, the spring 12 hours while in winter it should be kept to 8 hours. You can achieve this with the help of timers. Lamps used for spot temperature. The hot spot (basking) is necessary throughout the year. Chameleons the morning bask to absorb temperature and radiation. The heating is necessary for digestion and disposal of the animal. High temperatures can cause heat stroke and burns, unlike low hypothermia. The temperatures in the summer of hot spot should be at 33-37 ºC (91-98 ºF) daytime and 20-25 ºC (68-77 ºF) in the evening. During spring daytime hotspot temps should be 30-32 ºC (86-89 ºF) and 19-22 ºC (66-71 ºF) at night. In winter hotspot daytime temperatures should fall at 26-28 ºC (79-82 ºF) and 14-18 ºC (57-64 ºF) at night. The temperature in the middle of terrarium should be 5-6 degrees below the basking spot. In nature, the Chameleons water source is the dew drops that form and the rain that falls on leaves. To simulate this in captivity, we commonly use both an automatic sprinkler and dripper; alternatively you can spray the terrarium on both the plants and Chameleon making sure the water is at an ambient temperature. Chameleons lick water from the leaves which is how they hydrate themselves so the water intake should be done daily to prevent dehydration. Live plants and daily sprays in the terrarium will help enough to retain proper levels of humidity. The humidity in the morning should fall to 60-70% and in the afternoon to 40-50%. The evening humidity should be going up again to 70-80%. This can be achieved with a early morning spray and an evening spray when the lights are off. Food is an important part of the care and health of the Chameleon so the insects should not exceed the distance of the eyes of a Chameleon in order for them to feed. Adults should be fed every other day while juveniles must be fed daily more than once. Offer 7-12 insects per day to juveniles and 10-15 insects to adult Chameleons. Crickets (Acheta domestica, Gryllus bimaculatus) and grasshoppers (Locusta migratoria) are a reliable food source with a good number of proteins, tissues, fat, carbohydrates and water. Other types of insects can be flies (Musca domestica and Drosophila melanogaster), mealworms (Tenebrio molitor) and superworms (Zophobas morio). For adults you can add to their diet newborn mice (Mus musculus) or young rats (Rattus norvegicus). Chameleons prefer variety in their diet so you should avoid feeding them the same meals for a long period of time. All insects should be dusted with calcium and multivitamins should be given at least 4 to 7 feedings. Another important part of retaining the health of your Chameleon is by giving them Feeder insects; they should be fed and hydrated before offered to the Chameleon. In order to maintain good health they should be fed with a rich variety of vegetables and fruits including cabbage, red cabbage, chinese cabbage, carrot, spinach, parsley, endive, apples, pears and oranges. These vegetables and fruits are sources of various vitamins which are essential to a Chameleons diet along with incorporating grated bone cuttlefish insects 1-2 times per week for calcium and fruitcream powder. Handling is not generally recommended but this does not mean that you can’t handle your Chameleon two-three times per month. Small Chameleons are more easily handled and get used to the contact quicker than adults do. 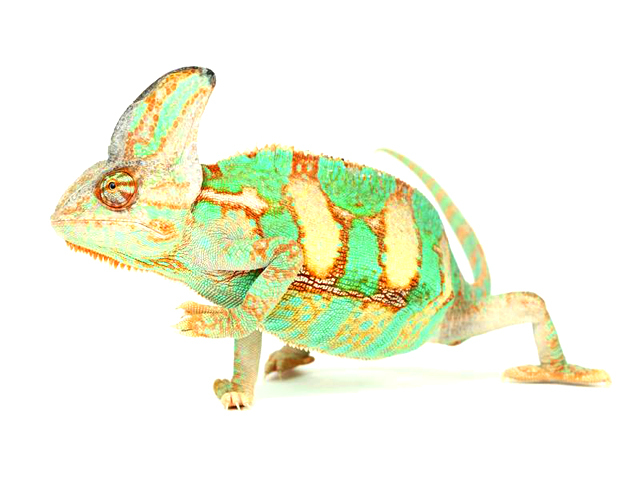 If an adult Chameleon has only been handled very few times in their lives they tend to be more fierce but it can depend of on the nature of each Chameleon. In my own opinion, handle your Chameleons as less as possible. Purification of the terrarium should be performed every one to one and a half months if there is a substrate. Faeces are to be removed daily from the terrarium. If not using a substrate, the bottom of the terrarium must be rinsed with hot water every week. It’s hard to say exactly how often the Chameleon changes skin but during that time make sure you have high levels of humidity as this will help the Chameleon to easily shed his skin. Low humidity may cause shedding problems and in the event that the old skin will not fall, this will create fungus in the certain area of the Chameleon’s body. The terrarium should be positioned to the point where there are no drafts as the drafts can cause pneumonia in Chameleons. Permanent low humidity can create problems in moult skin and dehydration whereas permanent humidity can cause fungal infections of the skin of a Chameleon. Overfeeding can cause hepatic steatosis, particularly from waxworms (Galleria mellonella). It does not immediately lead to the shutdown of the liver, nor death, but an extensive period of reduced mobility, sluggishness and drowsiness will occur. It is wise not to stress your Chameleon with regular handling because deaths usually happen after defense behaviors (Akinesis, Thanatosis, Shadowing) from excessive stress.